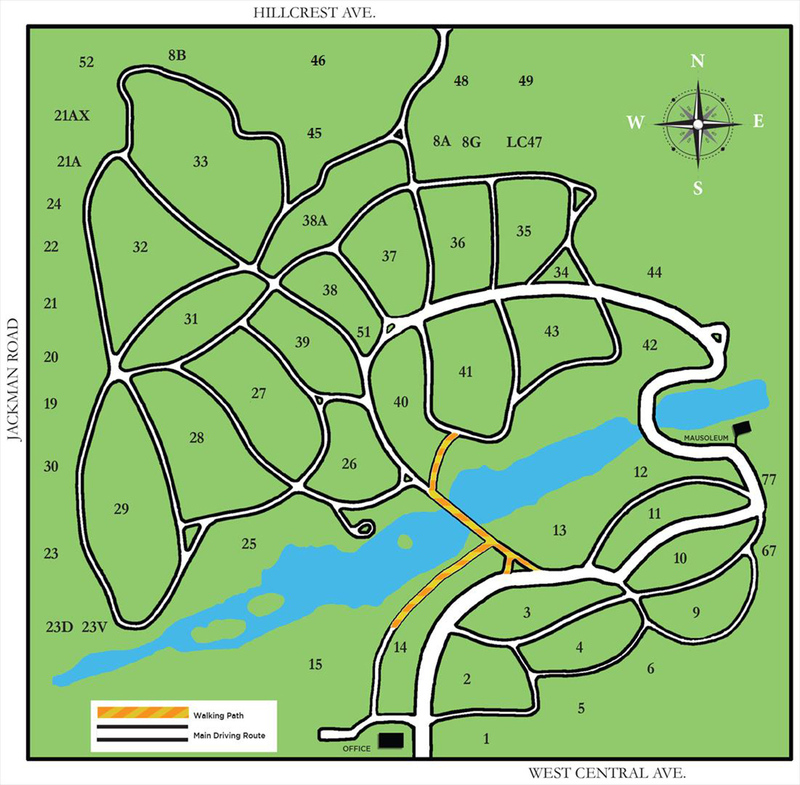 Woodlawn Cemetery is one of Northwest Ohio's most naturally beautiful properties and, based on its variety of trees and shrubbery, qualifies as the area's largest arboretum. The Board of Trustees is devoted to continuing improvements to enhance the appearance of the cemetery and, as such, encourages the placement of flowers and plantings. 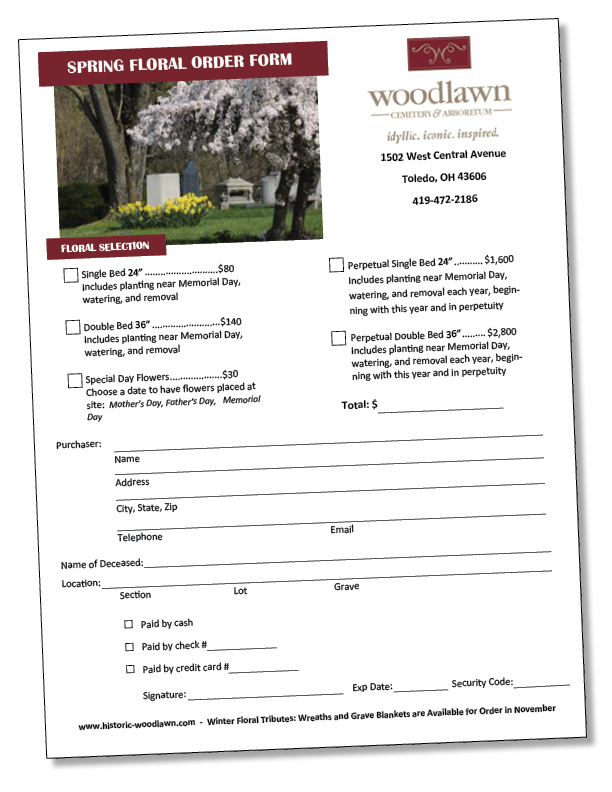 Property owners at Woodlawn may contract with the cemetery annually for special care for their property through Woodlawn's Service & Care Program. Regular mowing and trimming is included in the basic price of the property. The Service & Care Program covers the maintenance of added flowers, trees, shrubbery, or other seasonal plantings. Lot owners may also order flower placements for holidays or other special days through this program. A truly thoughtful way to honor the memory of your loved ones. Plantings are assorted varieties of annuals, selected for sun or shade lots. Placement will be in front of markers that are at the head of graves and behind markers that are placed at the foot of graves. The summer care season will be from Memorial Day thru Labor Day. Please complete the order form below and return along with your payment. As always, you may order fresh cut flower arrangements for any special day. Do not hesitate to contact our office with any question. Through our convenient Floral Placement Program, for Memorial Day, Mother’s Day, Father’s Day we will arrange for placement of a beautiful bouquet. You can express your love and remembrance even when time, distance or life’s obligations keep you away. Our convenient Seasonal Decorations Program ensures that your loved one will be remembered during the holiday season. We will place a beautiful wreath, at the location of your loved one. For your convenience we offer a selection of five beautiful vases that may be permanentally installed – ready and waiting for the floral memorials you bring, whenever you bring them. Place an order today or for more information call (419) 472-2186. For how you can add a Permanent Ground Vase for your loved one ask to speak to our Family Advisors. The purpose of these Rules and Regulations is to protect the interests of all owners as a group and to preserve the beauty and safety of Woodlawn Cemetery. They are approved by Woodlawn Cemetery Board of Directors. We sincerely request and appreciate your cooperation. It is our policy to remove decorations that do not meet our cemetery decoration rules. Spring Cleanup begins on March 1 every year. Cut Flowers are allowed at any time. Plastic decorations or artificial flowers will be allowed only during the winter season (November-March). Any plastic decorations left during the summer season will be removed and disposed. Potted plants may be placed on Easter, Mother's Day, Memorial Day, Father's Day, the 4th of July, and Labor Day. These pots will be removed about a week after the holiday to avoid creating bare spots on grass. 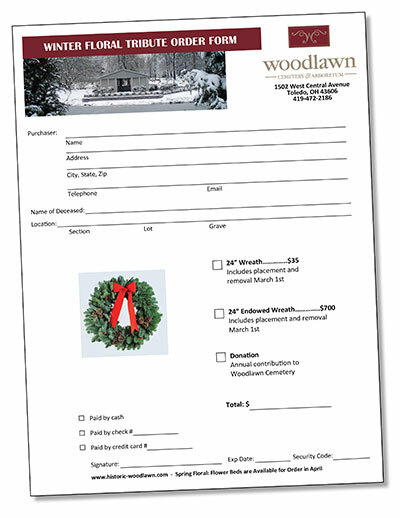 Winter Wreaths & Grave Blankets - After December 1, winter wreaths and grave blankets may be placed and can be left until March 1. 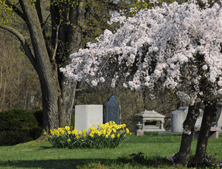 Any winter wreath or grave blanket, natural or plastic, remaining after March 1 will be removed. Individual Plantings - The planting of shrubs or trees, and the opening of flower beds may be made by cemetery and personnel only and will only be made on sites where allowed. Arrangements for these plantings and their care may be made by cemetery office. Any plantings, which become unsightly, will be removed. Solar lights are not allowed. Please call us with any questions concerning decorations at (419) 472-2186 or place an order today by downloading the forms, filling them out and returning to us.